This is probably the sweetest, most nauseating, can't-eat-anymore pie you'll ever eat...so just stick with small slices! It's a wonderful tasting dessert, rich and creamy, full of white chocolate flavor with just a hint of hazelnut and coffee. Yum! Add a crunchy chocolate crust, topped off with light and fluffy Cool Whip, and you've got a delicious end to a meal. 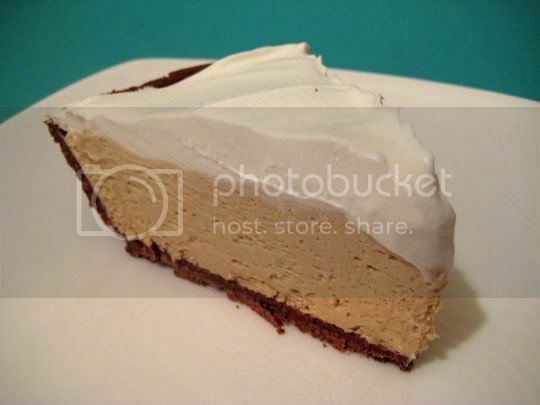 Better yet, the pie is extremely easy to make: simply whisk together white chocolate pudding mix, milk, whipped topping, and hazelnut-flavored instant coffee. Spread into a premade crust, and spread with the remaining whipped topping. This probably can be served right away, but I think it's best to let sit overnight (or at least for a few hours) to thicken up the pudding mix. Make again? Yes...just remember, SMALL SLICES. And serve with coffee to balance out the sweetness. De-lish...it must be the white chocolate. BTW, when did you stop with the strawberries? I thought they were so cute! ALL THAT IN 5 MIN SHEESH YOU ARE A MASTER.